This is a sequel to the story featuring two legendary and adventurous characters, Wind & Cloud. The Sword Worship Villa, the world's top sword maker, witnessed the bloody execution of its people due to allegations of conspiring to start a rebellion. The young master of the villa, Ao Jue, is the only survivor of the execution. In order to complete the “Jue” Sword, forged by generations of his family, Ao Jue swears to attack Tin Ha Wui and battle with Wind & Cloud in order to obtain the blood of the Flame Kylin which can unleash the power of the sword. With Wind's blood containing the blood of the Flame Kylin, he becomes the prime target in Ao Jue's plan of completing the sword. I'm going to keep this review short and simple to give the reader insight about the anime . 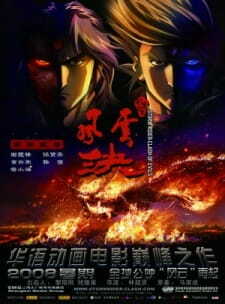 This anime ( movie ) is based on Manhua that goes by the name Feng Yun . Story is held in ancient China and is all about kung fu . So if someone is into watching kung fu or some good Majestic Martial arts , this is the anime . By Majestic martial art , i mean martial arts that involve super natural abilities and Ki ( Qui ) energy . Story development is just fine . It is good enough to make the non busy viewer stick to seat and complete the movie . It have some very good fight scenes and little bit of romance . Art is just great .You can observe the movement of clothes due to wind , light effects during fight ( fights are flashy ) . Scenic beauty is amazing. Language of the original movie is not Japanese ( I'm not sure if it's Korean or Chinese ) , so otaku's might find it difficult to watch it . Sound effects are good . It have great sound for everything it shows , example movement of water , air , Kung fu background music . What it lacks is music that feels and touches the heart !!! Main characters are very cool looking . Characters have sense of honor and are little series type . I would actually give it 7.5 rating .Movie is enjoyable if you are looking for Adventure , Martial arts , expect anything else , it will be in your dropped list .